The U.S. Supreme Court is set to have a historically slow term, even with a batch of new cases expected to be added to its docket in the coming days, court watchers told Bloomberg BNA. January is the last month that the high court can add new cases to the current term’s docket without expediting briefing, Daniel Epps told Bloomberg BNA. Epps hosts the Supreme Court podcast First Mondays and is a professor at Washington University School of Law, St. Louis. 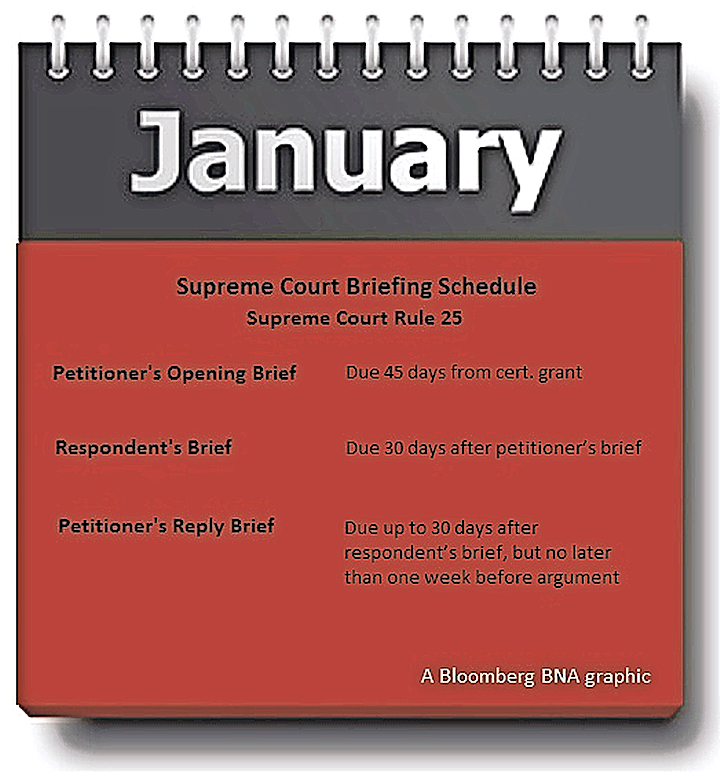 But the court still has about a dozen slots open in its March and April oral argument calendars, research by Bloomberg BNA shows. The court will likely agree to hear a few additional cases, but the justices probably won't take up that many, Epps said. The court is more likely to try and spread out what it already has, peppering in any new cases, for light March and April sittings, Supreme Court veteran John P. Elwood, of Vinson & Elkins LLP, Washington, told Bloomberg BNA. That would mean a slow term for a court that is “already at or near historic lows” for cases decided, Epps said. But the justices “will likely count their blessings that it wasn’t worse” given that the court has been shorthanded for nearly a year following the 2016 death of Justice Antonin Scalia, Elwood said. The Supreme Court’s terms begin in October and they usually issue all opinions by the end of June. However, the court usually only hears oral arguments from October to April. During each of those seven argument sessions, which occupy two weeks per month, the court generally hears around a dozen cases. But the court has to agree to review cases first, known as granting certiorari. The justices hold conferences between two and four times each month from October to June to discuss pending petitions for certiorari. This term, Jan. 23 is the “technical cutoff date” that the court could grant certiorari for new cases in the current term without expediting briefing, Elwood said. But as a practical matter, the second January conference when the justices meet to discuss pending petitions is usually the actual cutoff date, he said. This year, that date is Jan. 13. Any cases granted after that date will likely be put off until next term, even if it means that the court won’t fill up its March and April calendars, Elwood said. We’ve seen from recent terms that the court is willing to tolerate as few as seven cases in a sitting in order to avoid expedited briefing, he said. Former Chief Justice William Rehnquist wouldn’t have flinched at expediting briefing by several weeks, Elwood said. In fact, “expedited briefing became commonplace towards the end of the Rehnquist Court,” he said. “But we really haven’t seen very much expedited briefing during the Roberts Court,” Elwood said. That’s probably because Chief Justice John G. Roberts Jr., who himself argued several cases before the high court, likely appreciates how hard it is to finish up briefing on a tight schedule while also preparing for oral argument, Elwood said. Roberts may also believe that expedited briefing “diminishes the quality of advocacy and thus impairs the court’s decision-making process,” Elwood said. To fill up this term’s calendar, the court would have to agree to hear between 11 and 15 new cases. The precise number of available slots depends on if the court schedules four cases that it appears to be holding: Murr v. Wisconsin, No. 15-214, Microsoft Corp. v. Baker, No. 15-457, Trinity Lutheran Church of Columbia, Inc. v. Pauley, No. 15-577, and Gloucester Cty. Sch. Bd. v. G.G., No. 16-273. These cases have been fully briefed, but haven’t been scheduled for argument. Some court watchers have speculated the court is waiting for a ninth justice to be confirmed before scheduling arguments. The court has “relisted” 27 cases for its Jan. 13 conference, meaning they have been discussed already at at least one prior conference. Recent court practice has been to relist cases before actually agreeing to hear them, meaning all 27 are candidates to help fill the remainder of this term's calendar. Epps said there are multiple reasons why the court is unlikely to grant a dozen cases by the cutoff date. Epps said the difficulty is in part due to “simple math”—it’s just harder to get the four votes needed to grant certiorari from eight justices than it is from nine. That second rationale may “disappear now that a new Justice seems likely, but not certain, to be on the Court by April,” Epps said. Trump said during a press conference Jan. 11 that he plans to name a nominee within two weeks of his Jan. 20 inauguration. At “the very least, the four liberal Justices will be pretty gun shy now and for the foreseeable future” on granting cases, given the expectation that President-elect Donald Trump will nominate a conservative to fill the vacancy, Epps said. 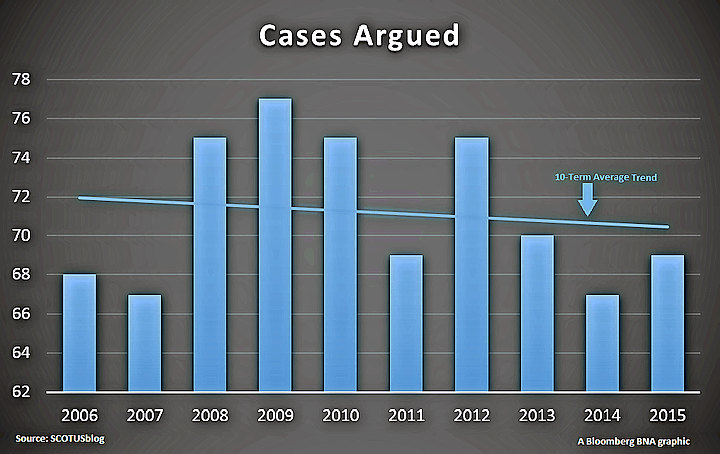 Even if the court does fill up its March and April oral argument calendars, the court will continue a trend over the past few decades of hearing fewer cases. Currently, the court has only accepted 54 cases for review, including the cases that are being held. Still, Elwood said the court’s workload is pretty good considering all the challenges it has faced this term. The court has been shorthanded since Feb. 2016, due to GOP senators’ refusal to confirm President Barack Obama’s Supreme Court nominee. As a result, the justices have “spent most of the term avoiding cases that might have resulted in a 4-4” vote breakdown, Elwood said. Moreover, they’ve lost cases due to procedural problems and changes in the parties’ litigation positions, he said. “When you consider all the factors that combined to keep numbers low this Term, it could have been worse,” Elwood said.